What if the BW IQ difference is entirely due to environment ? 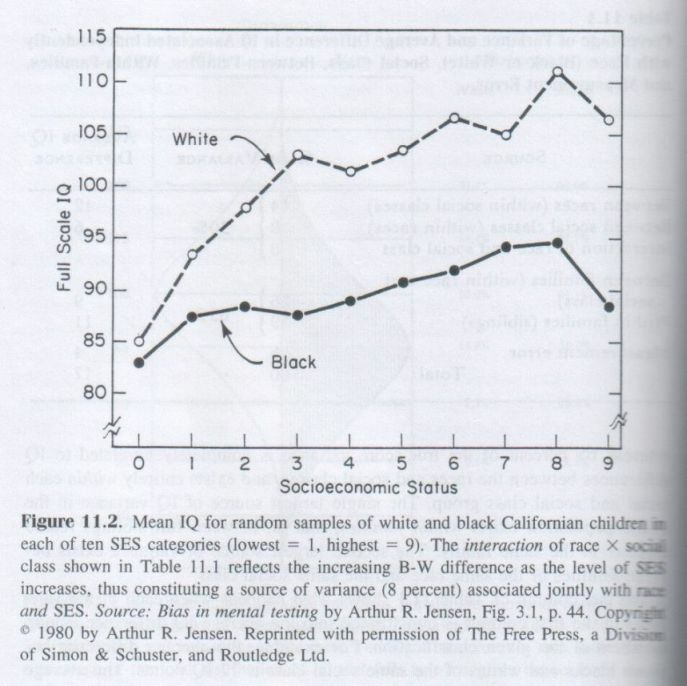 What happens if the Black-White IQ difference is entirely environmental in origin ? I argue here that we cannot be certain that the gap will disappear, and it is even possible that the gap would have increased if the between-group heritability (BGH) of IQ was lower than what it actually is. Insofar as the socio-economic status (SES) is an index of cognitive stimulation, through wealth, culture, life style, parental expectations, parenting, and so on, it would be useful to examine the magnitude of the IQ gap at different levels of SES. The major social problems involving g arise from the dual conditions of critical threshold and critical mass. Largely because of economic selection, people in the lower segment of the normal distribution of g gradually become segregated from the rest of the community, not only in regard to where they live but also in how they live. … People’s environments, or their perceptions of them, differ in complexity and cognitive demands. One might even characterize different environments in terms of their g loadings. As the selection process accelerates, the percentage of low-ability persons residing in the same locality approaches what might be called a critical mass, in which a majority of the inhabitants of the neighborhood segregated by low g falls below the critical threshold. The more able and ambitious residents leave the area; its economic viability dwindles; and those left behind come to constitute what is now referred to as the underclass. [10b] This is the blight of the so-called “inner city” of many metropolitan areas. The “culture of poverty” spontaneously engendered by these conditions hinders upward mobility, most unfortunately even for those youths who possess an average or above-average level of g and would predictably succeed in a decent environment. This is indeed the gloomy side of the g nexus. … Although low IQ persons who are reared in the favorable environment of fully capable parents and relatives experience the usual cognitive disadvantages of subthreshold g in scholastic performance and level of employment, their disadvantage in dealing with novelty and complexity is generally “buffered” by their relatives and caring neighbors, who can mediate for them when necessary in their encounters with the more g-demanding problems of daily life. When the cognitively disadvantaged are sparsely dispersed among responsible relatives and neighbors of average and higher IQ, they escape the multiplier effect of their disadvantage that results when many low-IQ persons are segregated together in a neighborhood. Now, let’s assume, for the sake of the argument, that the IQ gap is decreasing when SES levels go up and/or that IQ gap is reduced to almost nothing when all the environmental factors have been controlled. Does this mean that the core of the hereditarian hypothesis must be rejected ? Of course, not. The environmental hypothesis however would consider it otherwise. The sociologist fallacy goes like this : insofar as the IQ difference is reduced by equating environment, it follows that the reduced IQ gap necessarily reflects an environmental effect. They are just reversing the direction of causation. When difference in economic background is removed, the characteristics and traits that were initially causing those differences in economic background have been removed too. For practical purposes, environments are heritable too. The child who grows up in a punishing environment and thereby is intellectually stunted takes that deficit to the parenting of his children. The learning environment he encountered and the learning environment he provides for his children tend to be similar. The correlation between parents and children is just that: a statistical tendency for these things to be passed down, despite society’s attempts to change them, without any necessary genetic component. In trying to break these intergenerational links, even adoption at birth has its limits. Poor prenatal nutrition can stunt cognitive potential in ways that cannot be remedied after birth. Prenatal drug and alcohol abuse can stunt cognitive potential. These traits also run in families and communities and persist for generations, for reasons that have proved difficult to affect. The inference to the truth of the environmental explanation is premature here because the genetic hypothesis can also account for the decrease in the IQ difference between the two groups in this situation. For, it may be that matching whites and blacks on SES has the consequence that the two groups are matched on genetic characteristics as well. If that is the case, it may be that it is the genetic similarity that causes IQ similarity. Similarly, Plomin and Colledge (2001) warned against the misinterpretation of what is called culture, as they say, “average differences between cultures are not necessarily “cultural” — they might be due to genetic differences between cultures.” (p. 231). In other words, the heritable traits that are behind those differences in culture. And the same goes for differences in socio-economic background. Since africans, asians, and whites are not biologically equal, the races differing in so many traits (Rushton, 1997, pp. 153-163; Fuerle, 2008, ch. 9, 10, 11), we have to expect ‘natural’ differences in outcome to arise. Controlling for environmental variables makes sense only on the unrealistic assumption that blacks, asians, and whites, are not different at birth to begin with. Since people are perceived differently and perceived themselves differently, they will choose different pathways in accordance with their inherited skills. Success and motivation are mutually reinforcing, with the former driving the latter rather than the reverse (Lai, 2011, p. 15). Because of these innate differences, one should not expect that members of different groups are equally motivated in pursuing the same activity given the differences in innate abilities. The similarity of friends can be used to illustrate the idea of an active GE correlation. Delinquent boys befriend other delinquent boys; smart teenagers join with other smart teenagers; and jocks may seek their company among other athletes. High school cliques often form around common interests and characteristics. In many cases, the characteristics that led to assortment existed before the assortment took place. In 1978, Kandel completed a classic study of friends by following friendship formation and dissolution during a school year. Her study focused on four characteristics, including minor trivial delinquency. She found that before a friendship formed during the school year, prospective friends were already similar to one another in their levels of trivial delinquency. On trivial delinquency, the correlation of “friends to be” at the start of the school year was .25. The correlation of friends who remained friends throughout the school year was .29. Thus, to count the full .29 correlation as entirely “influence” would be to misinterpret its origin because some part of the .29 association existed before friendship formation (i.e., a selection process). Kandel also found that friendships that dissolved during the school year tended to be those friendships between the most behaviorally dissimilar friends. She also observed a second phenomenon: friends becoming more similar during the duration of their friendships. Using a complex statistical analysis, Kandel determined that about half of friends’ similarity was due to selection and half was due to influence (Kandel, 1978, 1996). Another study examined an even earlier precursor to adolescents’ behavior: infants’ temper tantrums (Caspi, 2000). In children all born in the same year (i.e., a birth cohort), 3-year-old children were distinguished according to whether they had temper tantrums. Anger and temper in the 3-year-old children predicted their criminal behavior, antisocial personality disorder, suicide attempts, and alcohol dependence at 21 years. Surely, selecting delinquent peer companions cannot have caused the explosive temperament of the 3-year-olds. In light of this discussion, we understand now what is wrong behind the plant analogy, once used by Gould, Flynn, Lewontin, among others. The logic goes like this : take two plants with identical genes, with one growing in a rich soil but not the other one, and the former will flourish while the latter will die. Humans are not plants however. Unlike plants, humans build their own environments, thus maximizing or diminishing the environmental conditions for cognitive development. Environments are not independent of man’s free will. A clear evidence of this is that social inequality may increase when the availability of some resources (e.g., health care) is equalized. To the extent that environments have been equalized, the remaining variance in IQ must be increasingly genetic. And this claim holds true even if IQ heritability is near zero. The fact that “equalizing the availability of health care does not equalize its use” tells us something about its cause. This is because the job of a patient is becoming more complex, requiring extensive self-regulation today than before, as a consequence of the increased complexity of modern societies. Gottfredson argued that social inequality is increasing in a situation when people have to rely more on their own judgment (i.e., when the advantage of a higher g is the most salient), or when the tasks rely essentially on the individual’s own judgment in everyday life. On the assumption that the B-W IQ gap has an heritability of zero, IQ being more sensitive to one’s own action and solely depending on non-g factors causing the B-W difference in environments, the combination of the positive effects of the good choices made by high-g people with the negative effects of the bad choices made by low-g people tends to exacerbate the IQ gap. And in a society which is becoming more and more complex, the advantage of g becomes more important. And social inequalities naturally grow up. Insofar as the differences in behavior have a genetic component, it cannot be said that the B-W gap has a heritability of zero, if the traits that cause those differences are heritable too. This essay taught me something I hadn’t thought of, although the insights expressed in it are clearly not novel. But the essay needs very careful editing. The title and first sentence, for example, are just not clear. For example, the first sentence begins “What happens…”. What does that mean, “what happens”? Do you mean something like “what can we expect to observe” or “what can we expect to observe over time”? . A couple comments (constructive criticism) on some other specific statements. First, the statement “The IQ gap may be even larger than it actually is” is nonsense. (“I’m taller than I actually am” Huh?) Second, “Success and motivation are mutually reinforcing, with the former driving the latter rather than the reverse” is also nonsense. Variables being mutually reinforcing literally means each drives the other. I can see close alternate interpretations of this statement that might make sense, but as written, it’s just not right. I don’t want to be harsh. Again, I learned from this essay and I look forward to reading more. Practice your editing skills. It’s a skill that I personally lack, but your essays will be much more valuable to a much wider audience if your clarity improves. Good luck! If we accept the idea that familial environment has a negative impact on IQ among low-IQ families and a positive impact on IQ among high-IQ families, as expected under the Dickens-Flynn model or the cumulative deficit hypothesis to a lesser extent, then it would not be difficult to imagine how the gap could be increased in this way. And, as I said, if education really exerts an impact on IQ, given a lower IQ heritability, I would expect the gap to increase if interventions stimulate the brighter children more than the dumber ones. What I was saying is that the effect of earlier success on later motivation is more important than the effect of earlier motivation on later success, probably because motivation is self-reinforcing. Finerman is right, even though I understand what you are trying to say. What you wrote is like saying “x may actually be greater than x”. It’s logically impossible for x to be greater than x because x=x exactly always. What I think you meant is that the gap would be larger in the hypothetical case you described than in reality. But it was hard to understand. Overall, it was an interesting post, though. The “thus” makes it seem like you are saying wgh=0 implies bgh=0. But that is not true. The value of one has no necessary implication about the other. There is a famous example in one direction about bags of seed. If you have a bag of seed and you grow each seed under identical conditions, 100% of the variance in height is due to genes, so wgh=1. If you have a second bag with an identical distribution of genes, but grow them in a different condition, you will have bgh=0. Less well known is that this works the other way too. If you have a bag of seeds that are all clones of each other, and grow them in a field with a variable environment, wgh=0. If you have a second bag of seeds that are also clones of each other, but not clones of the seeds in the first bag, and grow them in a field with the same distribution of environments as the first, wgh=0, but bgh=1. “[A]n observed score is said to be measurement invariant if a person’s probability of an observed score does not depend on his/her group membership, conditional on the true score. That is, respondents from different groups, but with the same true score, will have the same observed score. (Wu et al. )” In instances where there are factors that vary between groups but not within — thus able to cause bgh>1, when wgh=0, true scores will be conditioned on group membership and thus violate MI. Your point, of course. is correct in general. It just isn’t relevant to the difference under discussion. It’s as if you noted that IQ score differences don’t necessarily imply latent ability differences. Well, true — but, we are discussing an instance in which we know that the score differences are commensurate with latent differences. Generally, a level of familiarity with the background information is taken for granted in these discussion — but maybe some of these points are less well known than we assume and so deserving of clarification.